Blondie and Brownie: It's a Robicelli's Miracle! Their June menu is packed with fun summer flavors. 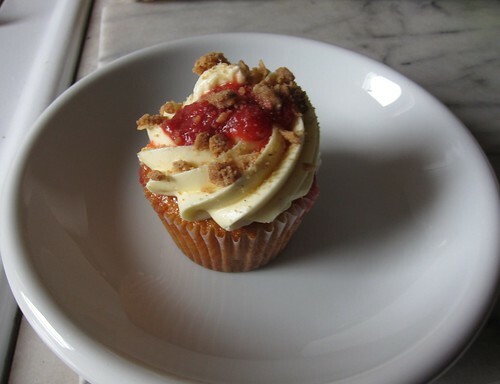 Here's the list of what I plan on eating and writing off as pre-birthday cupcakes: the Strawberry Shortcake, the Peach Cobbler, the McFadden, the Strawberry Balsamic, the Raspberry Lemonade, the Apricot Chardonnay, the Ebinger (can attest that the buttercream is fabulous on this one,) and of course, another Strawberry Rhubarb Crisp. Can you tell I grew up in the South eating desserts like these? Plus you only turn 30 once and I plan on living it up! Be sure to double check their Twitter and/or Tumblr before heading out to get a cupcake, not all stores get all flavors or deliveries every day. I am all about these cupcakes; I think they are slightly evil and addicting. I really only feel that way after eating 3 and forcing myself onto that horrid treadmill. Happy Birthday; in advance!